Read more about Energia's high performance window and affordable interior storm window options. Indow window inserts are made out of acrylic glazing and edged with our patented Compression Tube. The tubing compresses when pressed inside your window, holding the insert securely in place while sealing out cold drafts, hot air, and outside noise. The tight seal delivers superior performance and ease of use, making our window inserts an excellent way to insulate your windows. Indow Windows are window inserts made out of acrylic glazing and edged with a patented Compression Tube. The tubing compresses when pressed inside your window, holding the insert securely in place while sealing out cold drafts and hot air. The tight custom seal delivers superior energy and sound performance at a fraction of the cost. Indow window inserts give you energy-saving insulation equivalent to double-pane windows, and they're even better at insulating sound. Plus, you don't have to worry about any lead contamination that can occur when your old windows are ripped out of the walls. Each Indow window insert is laser-measured and custom made to fit your window precisely, making them easier to use than storm windows. Read more about product options and our laser tailoring system. The tight seal between the Compression Tube and your window frame provides exceptional window comfort performance, keeping at bay cold drafts and blocking heat during the summer. Indow storm window inserts provide superior comfort no matter the weather or temperature outside. A U.S. Department of Energy study found that installing Indow inserts led to a 20% reduction in heating, ventilating and air-conditioning use in a Seattle home. Another separate study by Portland State University’s Green Building Research Lab found similar results from the use of our indoor storm windows. Comparing gas usage before and after installing Indow window inserts in four Portland-area homes, the lab found heating-energy costs were reduced by an average of 19%. 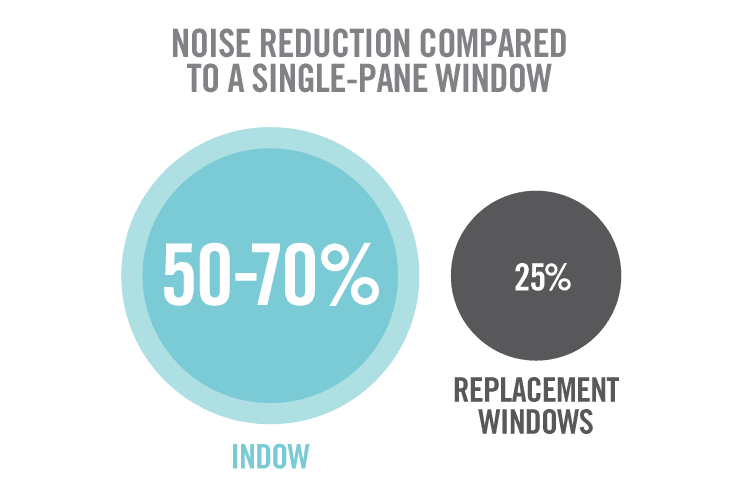 Indow window inserts have 94% of the insulation of standard double-pane windows. The surface of an acrylic Indow insert is much warmer than the surface of a pane of glass, so you’ll feel warmer even if the air temperature in both cases is the same. Increasing the surface temperature of your window space leads to increasing the mean radiant room temperature. This allows you to keep your thermostat at a lower level for ever further increased savings. Read more about this study from the Green Building Lab. ** R Value measures the thermal resistance of a material and its effectiveness at keeping the outside out and the inside in. Why Is My Upstairs So Hot? Across Massachusetts, many homeowners are struggling to get comfortable at home over the summer. You may be one of them! If your air conditioner is running over time, but the upstairs is still too uncomfortable, you might be wondering what’s wrong. Is it a problem with your AC? How Can Home Weatherization Ease Your Allergy Symptoms? Since spring is finally here in Massachusetts, the blooming trees, grasses, and flowers remind many people about their allergies. However, it’s not just the outdoors that can cause allergy symptoms. Many things in your home’s air can be inducing symptoms as well. Although energy efficiency is important year-round, Earth Day (April 22), might give you another reason to think about it. If you’ve slowly been taking measures to decrease your energy use and be kinder to the planet, making your home more energy efficient can quickly add up towards your efforts. If there’s one thing that most New Englanders can agree on, it’s that our weather tends to be relatively unpredictable. Winter may have been warmer than usual for the most part, but just because it’s warm one day doesn’t mean it won’t snow the next. There is perhaps no region in the country where it’s more important to focus on home efficiency and weatherization, which ensures that your home is prepared for whatever elements may come its way. While many homeowners believe that home upgrades are too expensive and out of their reach, the fact is that there are a number of financing options available, such as the Mass Save program.